April 15th came, and Coco Key had a minor setback. The Waterpark portion of the resort was not 100%. Now just a week later, the waterpark is 100%, staff is trained, beds are turned down, and the whole resort is ready for business. The grand opening of the resort was held Thursday at the parks covered section to a roar of applause as the final ribbon was “cut”. Accentuate it does. The park was fully operational, with full staff and crew on hand for all the festivities. The presentation included “Coco” the parks Parrot Mascot giving a check to Orlando Charity, “The Gift of Swimming” a charity that helps those who may not have the means to learn how to swim, the means and the lessons to do just that. Three of their young members slid down the parks “racing” slides into a ribbon to mark the opening of the park. The atmosphere and the feel of the hotel was just what was promised. It was relaxed and laid back, with a very “Key West” feel and spirit. Every single thing that Hotel Manager Frank Key told us about in our earlier tour was there. The aroma of cookies as you walked into the hotel, the warm friendly greetings to the fire pit out by the pool, and yes the slides. While the three main slides were not able to be opened just yet, we were told they would be opened by the weekend. The three included two tall tube slides and a Boomerang, one of only eight in the United States. Still, with the Parrots Perch play area operational as well as the kids pool and slide area, the arcade and the restaurants it was plenty to keep everyone busy. As for the staff, I realize this is a grand opening and the resort definitely put it’s best foot forward, however the staff was second to none. All seemed eager to be there and very friendly. If the hotel keeps this level of energy up with the staff, and keeps up with the quality that we’ve seen, it is sure to quickly become a favorite destination in Orlando. Much more than the Nick Hotel and “waterpark” at almost double the price. 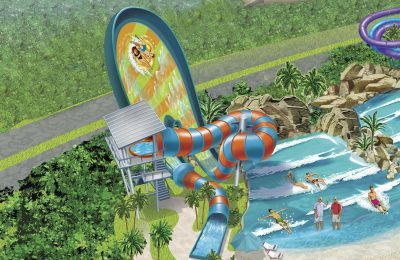 Speaking of the water park, it is giving Florida residents the chance to enjoy the park for the day for just $14.95 while non-residents will be $19.95. Rooms start at just $89.95 a night and will include your waterpark access for the entire length of your stay as well as everyone in your party. To learn more, visit the resorts official website. Previous PostIs Son of Beast Really dead? Next PostHaunt Con in Orlando plus Howl O Scream 2010 News!